The alcohol blood test checks the ethyl alcohol blood level. What is the alcohol blood test? The alcohol blood test measures the ethyl alcohol blood level. Why is the alcohol blood test important? Alcohol blood testing is done for screening or as part of an alcohol abstinence program. This Alcohol Blood Test is a blood test. Ethyl alcohol blood testing is usually done as part of an emergency workup on people suspected of having toxic alcohol blood levels although it is also used for general screening and as part of alcohol abstinence programs. To get an alcohol blood test near you, order online and get your blood drawn at the selected Quest Diagnostics lab. 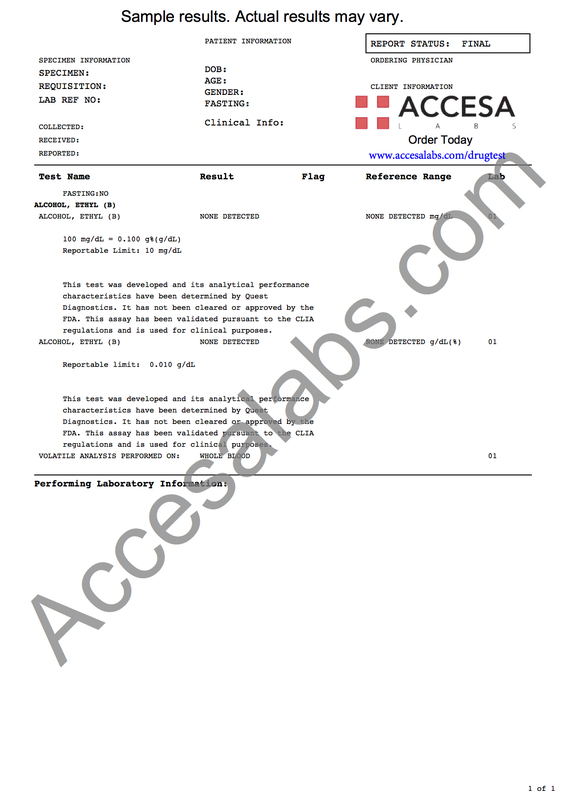 Once the blood alcohol lab report is ready, it will be available for download. As can be seen on the sample alcohol blood test report, a none detected result will be reported if no blood alcohol is detected. For an ethyl alcohol urine test, check out the alcohol urine test. Some people wonder whether fasting is required when getting a blood test for alcohol. Unless one is getting other lab tests at the same time that require fasting, fasting is not required for this alcohol blood test. Alcohol Blood Test at Guaranteed Prices.